No Category selected Move Over Susan Boyle, the Bunny’s Got Talent! Move Over Susan Boyle, the Bunny’s Got Talent! Like Susan Boyle, I dreamed a dream. I may not have her charm or talent but by golly, I know that if you work hard at something, believe in yourself and never give up…it just might happen. Ok that sounds totally cheesy but whatever a little cheese never hurt anyone. 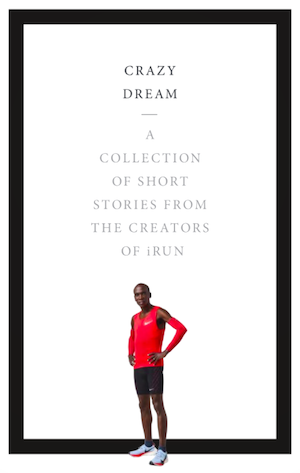 So back to the point: I am officially declaring that it is my runner’s dream to be a Pace Bunny (a.k.a Pace Rabbit). A Pace Bunny Grant. I want to run with pink bunny ears and my finish time sign. Don’t go there. I didn’t say I wanted to be one of those . You want to wear a full on bunny costume like him? Perhaps. I have no issues with costumes. I worked at Disneyland Paris remember? Cheese and costumes were all the rage. I know but I’m a Type A personality. There is no such thing as in between. It’s all or nothing. But do you have what it takes to be a Pace Bunny? Well, I’m not saying I will be pacing Lance Armstrong anytime soon (or ever actually). But yes, I think that in time, I will have developed the qualities necessary to be a successful Pace Bunny. Let me tell you about a little bit about your average Pace Bunny. First of all, they are normally volunteers. Their purpose is to assist other runners in accomplishing their goal of finishing the race within a specific amount of time. They do so by motivating, guiding, encouraging and comforting runners all the while setting the right pace. So it’s all fun and games. Actually, it isn’t. There is a lot of pressure put on those bunny shoulders. 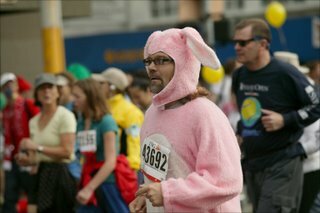 Don’t forget, Pace Bunnies are human and are subject to the same challenges as we are during a race. For example, they can become ill and not finish the race. Rest assured, most organizers will have thought of this ahead of time and planned accordingly as you will see there are usually 2 to 3 Pace Bunnies per finish time. 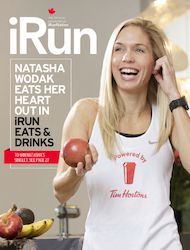 Plus, in the midst of all the craziness that is race day, they are also like tour guides in that they are subject to a lot of attention and questions from runners and spectators both at the beginning and end of the race. It looks like a really fun yet challenging experience. 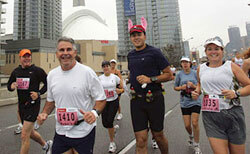 If anyone wants more information on becoming a Pace Bunny, contact your local Running Room because they supply the Pace Bunnies for a lot of major running events across Canada. I am certain they will be able to provide you more details on how to become a Pace Bunny! Self-described “running nerds,” Vicky and Grant are co-workers who “spend their lunch hours at the nearest bookstore and will often be seen around the office getting excited about a new energy bar or running gadget.” The duo captured our attention with their unique (double) take on Running Blog Idol, pledging to address a host of different topics including Canadian running heroes. Their submission to our contest even included a sample vlog (available at youtube.com/watch?v=oy4oDokN1Qo), which they promise is “but only a mere example of the lengths we are willing to go in order to share our experience, knowledge, research and general ramblings.” Holy multimedia, Batman!